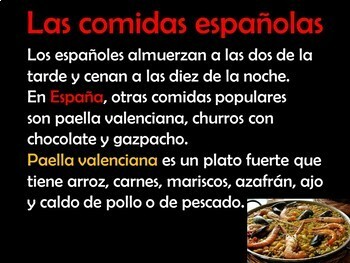 This Spanish foods lesson teaches about popular dishes in Spain like tortilla española, gazpacho, tapas, churros y chocolate and paella valenciana. 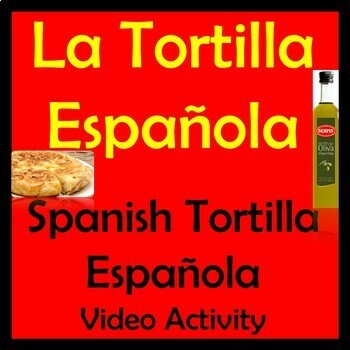 There are informational slides in Spanish as well as one tortilla española video activity with answer key included. Use this video and foods lesson for cultural comparisons, discussion starters and a brain break during a foods or health unit. 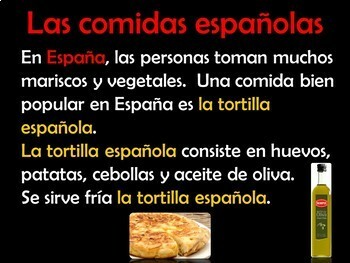 This activity is perfect for a Spain unit or a cooking unit as well. 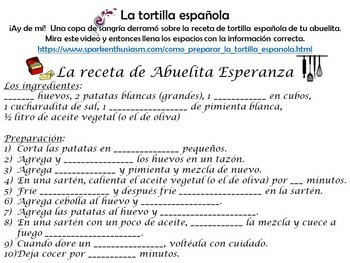 Also included is an extensive list of videos and resources for comidas, desayuno, alimentos, and bebidas lessons. Click here for the entire foods MEGA UNIT! Spanish Foods & Drinks Interactive Mega Unit!